The Heisler in its two-truck version was introduced in late 1977 by AHM. The model was launced with a $79.99 introductory offer. The regular retail was $119.98, begining in 1978. RP-25 flanges were standard from the start and four roadnames were present initially: Coos Bay Timber, Deep River Logging, Pacific Lumber, and West Side Lumber. 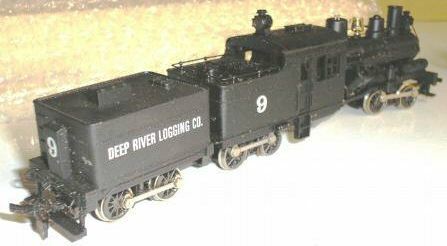 AHM brings two new roadnames, Lehigh Coal & Navigation and Tioga Lumber Co., plus an Undecorated Two-Truck Heisler to its catalog in 1979. The retail price moved to $149.98, but an introductory $99.98 offering was made for a short time. 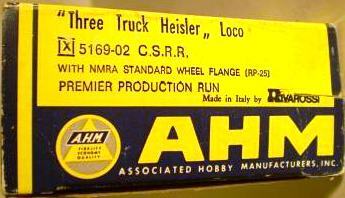 AHM's Two-Truck Heisler sold for $179.98 in 1980. 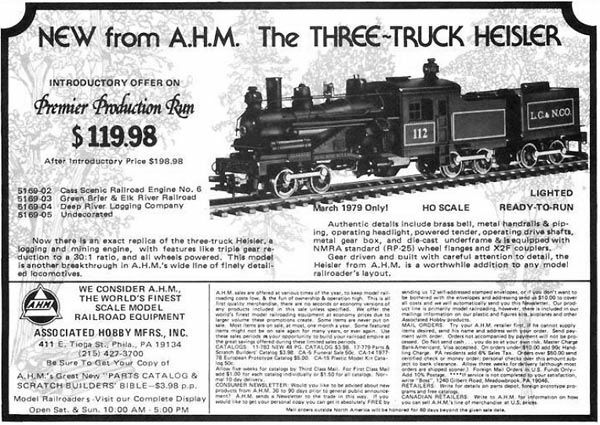 The 1981 AHM catalog only includes the Two-Truck Heisler. No Heisler steam engines are found beginning in AHM's 1982 catalog.